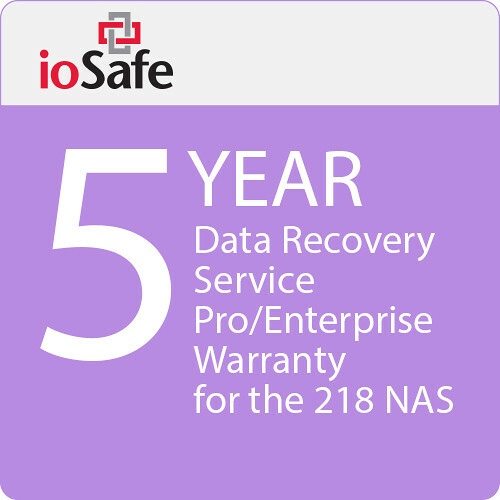 Upgrade the warranty coverage for your ioSafe 218 2-Bay NAS using the 5-Year Data Recovery Service Pro Warranty Upgrade from ioSafe. Their 218 2-Bay NAS comes with a limited 1-year hardware warranty and purchasing this upgrade will extend that coverage to a total of five years. This upgrade also includes ioSafe's Data Recovery Service Pro, which provides free in-house data recovery and up to $5000 per TB for the cost of third-party forensic data recovery. The costs of data recovery is limited at $25,000. Users will be allowed one data recovery event without the requirement to pay a deductible. Additional events will require a deductible of $500 for the second event, $1000 for the third event, and $2000 per event beyond that. Data Recovery Service (DRS) plans apply only to the original owner of the ioSafe product. Any data extracted will be loaded on a replacement product and shipped back to the original user. ioSafe reserves the right to use a factory refurbished product as the replacement. Please note that this warranty upgrade must be purchased while your 218 is covered by its 1-year hardware warranty.